Those are some thoughts that recent hire Carla Singh shared about her connection to Dell. How strong would a company’s brand be if every employee felt as connected and engaged as Carla? The Dell Champions program is one attempt to answer that question. What is a Dell Champion? Dell Champions (like Carla) bring our brand and purpose to life through action, participating in global and regional meetings, and special events. 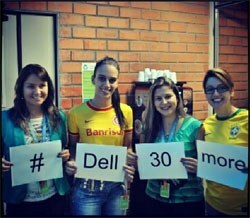 They drive the social culture at Dell and make sure customers see what Dell is all about. We believe our people represent our brand. Having brand and social champions around the world helps us to spread the Dell passion internally with colleagues and externally with customers. We offer brand and social media certifications for all employees to become subject matter experts. Once completed, participants can officially become part of the Dell Champions network, which numbers 1,200+ employees in 84 countries across the entire organization. As a global company, we understand the importance of being conscious and inclusive of different cultures, perspectives and views. In order to be successful, it is critical to keep this in mind and always regionalize all efforts, whether it’s internal activations, communications, corporate strategies, etc. At Dell, we do this very well. 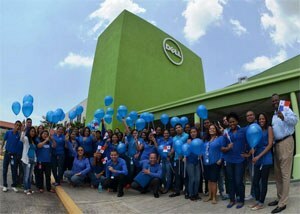 The Dell Champions based in Latin America are a fantastic example. With ambassadors in key countries throughout Latin America, such as Mexico, Panama and Brazil, we were able to increase awareness and grow the network from 105 to 505 champions in five months, making Latin America the region with the most Dell Champions. What does Dell get from successfully globalizing the Champions program? Improved collaboration/communication: By connecting real world employee networks online via social communities, you can reduce time spent searching for info and replying to emails. Advocacy and positive word of mouth: By empowering employees to amplify company messages and highlighting team wins across personal social media networks, you can build a stronger brand. Drive credibility and influencer relations: By establishing internal experts as active thought leaders around key company topics in an external environment.